When was your last family vacation? We do try to take a vacation every year, but it can be stressful trying to fit it into the budget. I believe a trip away is so important to catch up on life and really enjoy your family. Sure, you can stay home and not go to work, but there is always work to be done around the house. When you’re away from your home, you can really let go and enjoy. This is from our vacation in 2014. 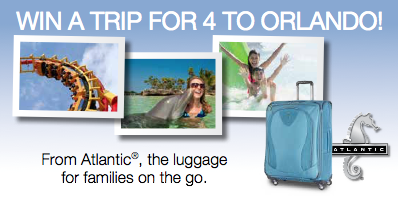 Right now, Atlantic Luggage is giving you the chance to win your family vacation this year! You can enter the Trip to Orlando Florida Sweepstakes, which includes round-trip airfare for four, 3 nights of hotel stay, four two-day admission passes to 34 of Orlando’s best attractions, $150 spending money and 4 carry-on pieces of Atlantic luggage with a total prize value of $4,270. Atlantic Luggage is making it easier for parents to travel with their lightweight, innovative luggage that features the Link2Go™ system, which allows you to connect multiple pieces of luggage for easy one handed rolling. I especially love their 360-degree 4-Wheel Spinners, making it easier to travel with little ones while dragging luggage through the airport or hotel. For the kids, we like to pack everyone a bag of their own. It’s just easier so I know exactly where to look for something when I need it. With kids, I’m even more of an over-packer than I am for myself (which is pretty hard to beat). You never know what you might need. To fit the most in the suitcase, roll your shirts and then stuff your shoes in the corners to fill in those spaces. Rolling your shirts also makes it easier to locate items while glancing into your suitcase. Lay everything out before you start packing it in the suitcase, that way you can really see what all you’re packing. No matter where you’re going, pack a sweatshirt. Nights are chillier just about everywhere. Pack items that can be worn with multiple items and not necessarily just outfits. Entering the Trip to Orlando Florida Sweepstakes is easy! Just enter your information and then you’ll receive this pretty little image to let you know you’re entered! You know that we entered! I’m always down for a free vacation! Orlando is definitely on our must-see list for family vacations. I know Charlie would want to spend his entire trip at Legoland. Grand Prize trip must be booked by March 31, 2016 and travel must be completed by June 30, 2016. If you have any great packing trips, share them below in the comments!